The old tower was destroyed by enemy shelling in 2014. 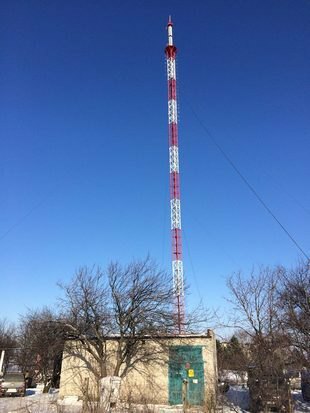 Ukraine on Monday, 5 December began broadcasting from a new TV tower on Mount Karatchun in Slovyansk. The commissioning of the tower was attended by President Petro Poroshenko, who is on a visit to Donetsk Region. The tower will ensure the broadcasting of four local and 10 national TV channels to a larger part of the region. Its signal must reach the city of Horlivka, currently controlled by Donetsk militants. After the launch of additional transmission capacities, the entire Ukraine-controlled territory of Donetsk Region and a part of occupied territories will be able to receive Ukrainian TV signal. "It can be said that the task that I have set - to restore the broadcasting of TV and radio channels - is being implemented, including the launch of the TV tower on Mount Karachun," Poroshenko said. The old tower was destroyed by enemy shelling on 1 July 2014.